Sebastian Vettel (Infiniti Red Bull Racing-Renault) wins the German Grand Prix ahead of Kimi Raikkonen (Lotus F1 Team-Renault) and Romain Grosjean (Lotus F1 Team-Renault). Full podium powered by the Renault RS27 engine. Mark Webber (Infiniti Red Bull Racing) finishes in 7th position, giving Renault-powered drivers four of the top ten positions and a total of 64 points. Williams F1 Team races in the points for majority of 60 lap Grand Prix. Double finish for Caterham F1 Team, with Charles Pic 17th and Giedo van der Garde 18th. Infiniti Red Bull Racing retains lead of both constructors’ and drivers’ championships. The Renault RS27 engine powered Sebastian Vettel (Infiniti Red Bull Racing) to his first win at the German Grand Prix today. The reigning world champion took the win by one second over Kimi Raikkonen (Lotus F1 Team), with Romain Grosjean third, giving Renault power a clean sweep of the podium. It is the second podium lock out for Renault-powered drivers this season following the Bahrain Grand Prix in April. Vettel took the lead of the Grand Prix at the start from polesitter, Lewis Hamilton, with Mark Webber second. The two carved out a lead over the Mercedes until the first round of pit stops, however Webber lost a wheel in the pits and dropped to the tail end of the grid, one lap down. The Australian nevertheless regained the lap under the safety car period caused by Bianchi’s stoppage, and from then on he had a spirited fight back to seventh overall. Vettel, the two Lotus and Alonso circulated within seconds of each other in the first two stints, setting up a grandstand finish for the third round of pit stops. Grosjean pitted first, with Vettel a lap later, but Raikkonen stayed out for a further 10 laps, giving him fresher option tyres for the final push to the end. He caught and passed his team-mate five laps from the end and started to reel in Vettel, but the German held on until the end to win his fourth Grand Prix of the year. Grosjean resisted intense pressure from Alonso in the closing stages to secure his second podium of the season. Pastor Maldonado and Valtteri Bottas both enjoyed strong races for the Williams F1 Team, running in the points for a long part of the race until delays in both of their pit stops forced them down the order. They eventually finished in 15th and 16th respectively. Caterham F1 Team finished just behind the Williams with Charles Pic 17th and Giedo van der Garde 18th. 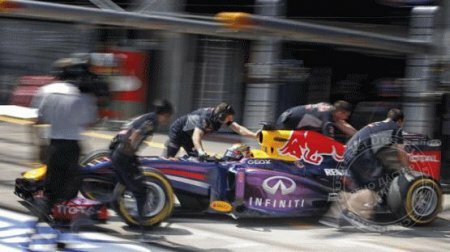 Infiniti Red Bull Racing leads the championship by 67 points over Mercedes, with Ferrari third and Lotus F1 Team fourth. Sebastian Vettel extends his championship advantage with 157 points over Fernando Alonso’s 123 and Kimi Raikkonen’s 116. Needless to say we are delighted with that result, with Renault-powered drivers locking out the podium. Moreover they fought the entire way, even on the last lap. It’s the first triple podium we’ve had since Bahrain in April, and very welcome at this point in the season – well done to all the guys at Viry and Mecachrome, who are working extremely well with the chassis teams in Milton Keynes and Enstone. We can also be very positive about Williams, who raced in the points for a long part of the race, but missed out in the pit stops. The long run pace is however something we can take forward to Hungary and build on. Likewise Caterham had a strong race, finishing ahead of Marussia. There’s a bit of a break now until the Hungarian Grand Prix so we’ll reflect on all of the events this weekend. Hungary is a circuit that normally suits the Renault engine so we’ll come back even stronger there.